• Greg Kuperberg and Włodzimierz Kuperberg, Double-lattice packings of convex bodies in the plane, Discrete and Computational Geometry 5 (1990), 389–397. • David Mount, The densest double-lattice packing of a convex polygon, DIMACS Series in Discrete Mathematics and Theoretical Computer Science 6 (1991), 245–262. • Thomas Hales and Wöden Kusner, Packing of regular pentagons in the plane. Abstract: We show that every packing of congruent regular pentagons in the Euclidean plane has density at most (5−√5)/3, which is about 0.92. 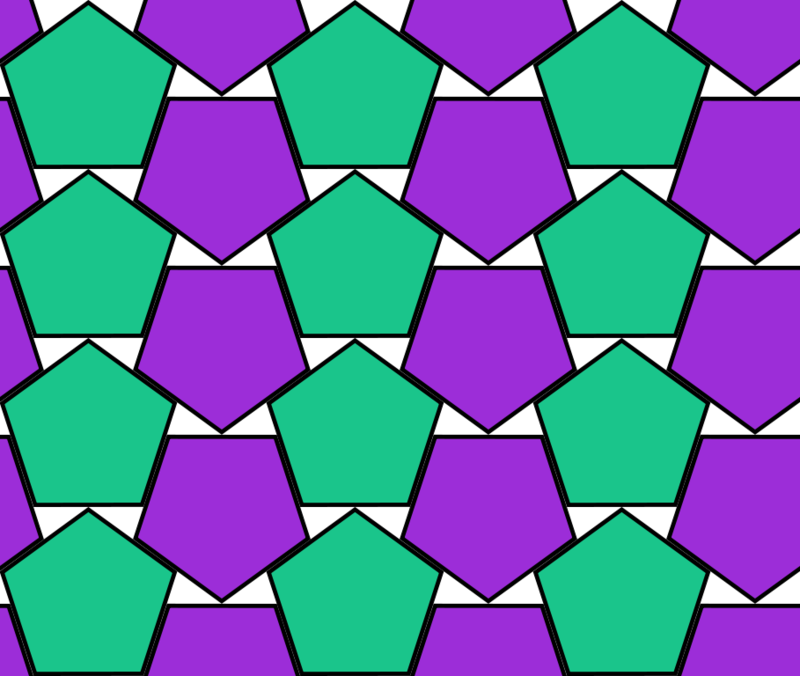 More specifically, this article proves the pentagonal ice-ray conjecture of Henley (1986), and Kuperberg and Kuperberg (1990), which asserts that an optimal packing of congruent regular pentagons in the plane is a double lattice, formed by aligned vertical columns of upward pointing pentagons alternating with aligned vertical columns of downward pointing pentagons. The strategy is based on estimates of the areas of Delaunay triangles. Our strategy reduces the pentagonal ice-ray conjecture to area minimization problems that involve at most four Delaunay triangles. These minimization problems are solved by computer. The computer-assisted portions of the proof use techniques such as interval arithmetic, automatic differentiation, and a meet-in-the-middle algorithm. Puzzle. Why is the formula for the density of the densest double lattice packing of the regular heptagon so much more complicated than the formula for the regular pentagon? The image above was created by Toby Hudson and put on Wikicommons with a Creative Commons Attribution-Share Alike 3.0 Unported license.